The Plus One woofer cone is a patented technology designed to deliver more diaphragm area than other speakers in the same size class. Because of their increased cone area, Plus One cones move more air, thus playing louder and overcoming the road noise inherent in a car. By radiating more air more effectively, the speaker performs as if it were a larger model usually associated with better low-frequency response. The end result is bigger and better sound. Infinity REF-6402cfx speakers feature vented voice coils through their magnet and frame assemblies. Keeping the voice coils cool leads to greater power handling and increased reliability, and helps eliminate the power compression that can cause distortion. It’s just another way that Infinity engineers ensure that you’ll enjoy these speakers for the long haul. The powerful, edge-driven fabric soft-dome tweeter design in the Infinity REF-6402cfx features greater power handling and lower distortion than conventional coaxially configured tweeters. These enhanced performance characteristics allow a richer level of detail in high frequencies and, in particular, vocal clarity that is lifelike because of the tweeter’s improved integration with the woofer cone’s frequency response and radiating patterns. UniPivot variable tweeter positioning is an innovative feature on the REF-6402cfx speakers that allows you to aim the tweeter at the listening location for better stereo imaging and high-frequency response at the listener’s ear. This feature is ideal for most in-vehicle speaker locations where the speaker is mounted off-axis with the listener, such as in upper dashboard locations that use most 4" x 6" factory sizes. A speaker featuring high sensitivity allows a wider range of power and definitively high volume levels without overdriving the audio system. Featuring a sensitivity of 92 decibels at 2.83 volts / 1 meter, the REF-6402cfx coaxial speakers achieve excellent volume and musicality with as little as 5 watts RMS. These numbers mean simply great performance overall with even very moderate power driving the speakers. It makes the REF-6402cfx speakers an ideal replacement for factory-installed speakers as well as for any aftermarket installation. Infinity Reference X high-fidelity speakers feature 3-ohm voice coils to ensure ideal performance, whether you use the speakers as an upgrade to a factory-installed audio system or connect them to aftermarket head units or amplifiers. 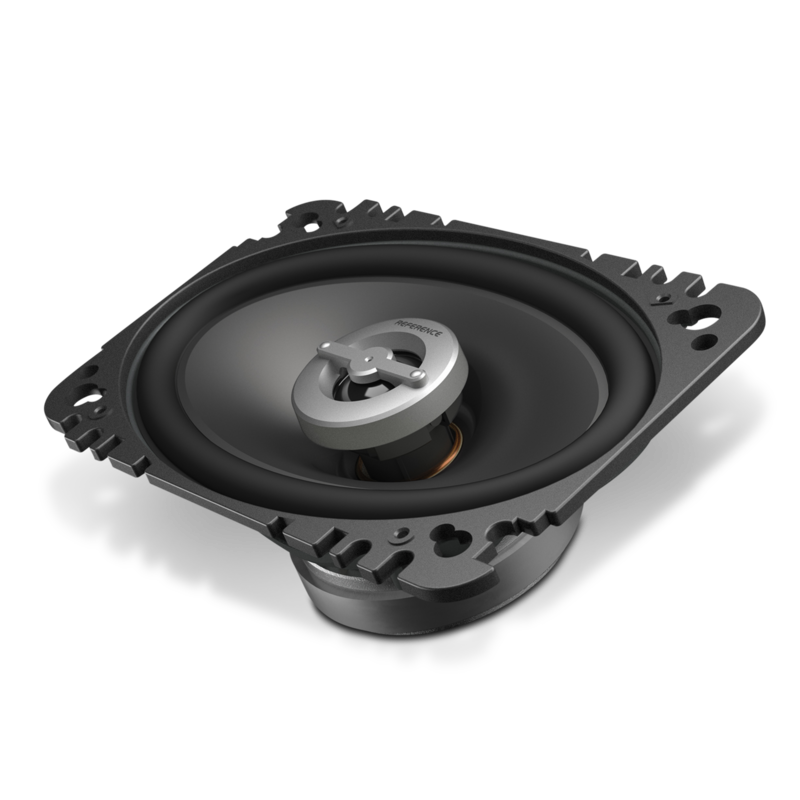 By ensuring the safe 3-ohm load along with associated wiring and connections, the power delivered to the speakers is right on target with peak system performance and reliability, which is how the speakers’ true 4-ohm technology works. Get all the power you’ve paid for and enjoy effortless, high-quality sound in your car. The Infinity REF-6402cfx coaxial speakers are part of a complete range of automotive speakers that fit factory-installed locations in virtually every vehicle on the road today. They leverage Infinity’s extensive pedigree of audio and engineering innovations and deliver remarkable sound in your car. You’re going to love these speakers. Infinity REF-6402cfx speakers include an additional set of mounting adapter rings. These rings allow the speakers to fit securely in a broad range of factory speaker openings that match thir size. Upgraded sound from a direct-fit 4" x 6" speaker automotive speaker. The Infinity® brand is known for a heritage dedicated to great sound reproduction. Whether it’s the lowest notes of a bass guitar, the wide bandwidth of a piano or the cymbal crash in the highest frequency ranges, the Infinity Reference X Series of automotive speakers has it covered. 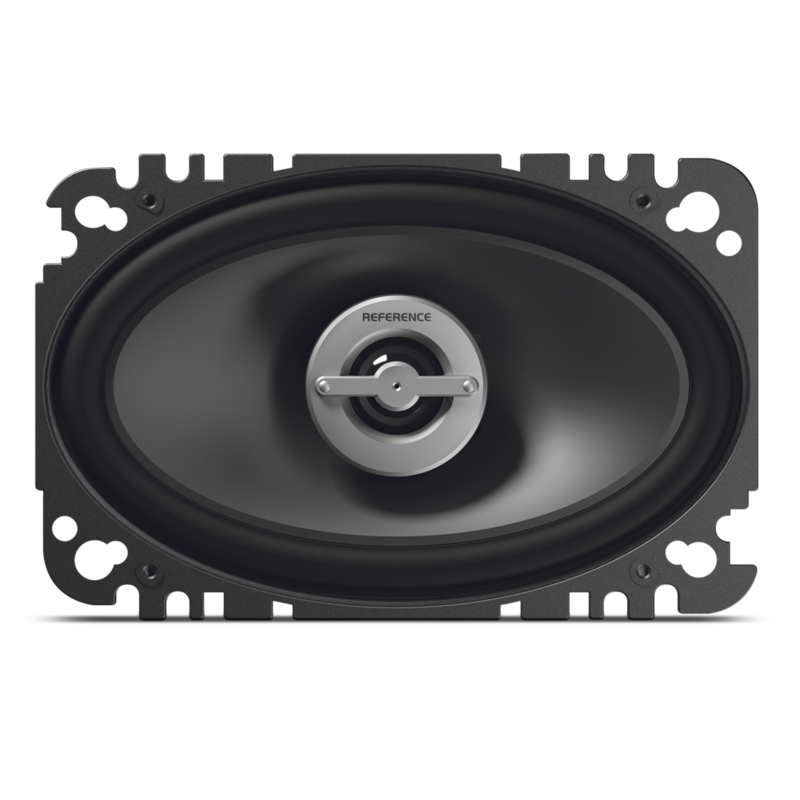 The REF-6402cfx is a 4" x 6", custom-fit, two-way, high-fidelity coaxial speaker with innovative features such as Plus One® (U.S. patent number 7,548,631 B2) polypropylene woofer cones, true 4-ohm technology, UniPivot™ edge-driven fabric soft-dome tweeters, an onboard passive crossover network and a tweeter level control that’s fully adjustable with the push of a button. The REF-6402cfx speakers are equally suited for head-unit or external-amplifier power because rigorous quality-control testing and voicing procedures ensure that they meet the tonal quality and power handling that you expect from Infinity products. Direct-replacement 4" x 6" sizing ensures a factory-quality fit. With a Reference X Series speaker available in virtually any factory size, every vehicle can experience the high fidelity and great value performance of these innovative automotive speakers. Listen to the Infinity Reference X Series speakers in person, then decide for yourself. Your car’s sound system will transform when upgrading to Infinity Reference X. You’re going to love these speakers.